Eurovision entrant Bonnie Tyler has been given the blessing of last year's contestant Engelbert Humperdinck - with a puzzling message in which he refers to the competition as the "pyramid of paradise". Welsh singer Bonnie has been unveiled as the UK hopeful with a track called Believe In Me which she will sing at the event in Malmo, Sweden. 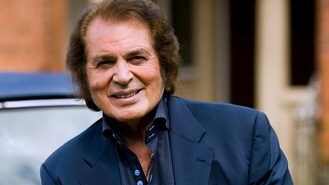 Engelbert, 76, has offered his congratulations to her in a slightly bewildering open letter, but suggested she could win. He wrote: "Dear Bonnie, I wanted to take this opportunity to congratulate you on being the one to represent our wonderful country. "The Eurovision was such a great step in my career and with the grand support of the BBC and my beloved country behind me, the loss of winning had me stepping on a loose unforgiving stone on a pyramid to paradise. But paradise will always be there for someone else to triumph in fair judgment to pride our country once again. Most Sincerely, Engelbert. PS You can do it Bonnie." Engelbert finished last but one in 2012 with ballad Love Will Set You Free when the competition was staged in Baku, Azerbaijan. He opened the contest but seemed to have been forgotten by the time voting started, 25 songs later. This year's competition takes place on Saturday, May 18, and will be broadcast by BBC One with commentary by Graham Norton, and on Radio 2 with commentary from Ken Bruce. Bonnie has had a string of chart hits including It's A Heartache, Total Eclipse Of The Heart and Holding Out For A Hero.